I like the idea of a non-meat burger… not burgers made with beans or chickpeas or lentils… but burgers made only with vegetables. 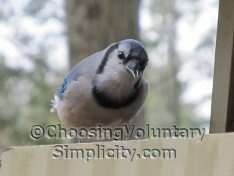 I have been trying to find a recipe that will make burgers like the ones we used to be able to buy several years ago. My homemade burgers taste better than those, but the burgers we bought were “drier” than any vegetable burgers I have made since then. 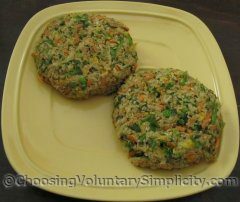 My favorite vegetable burger recipe to date is Very Veggie Burgers from the Easy Veggie Burgers Book. 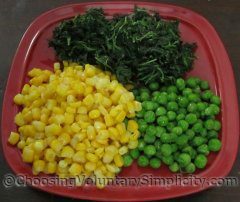 This recipe calls for a combination of corn kernels, potato, carrot, onion, spinach, peas, cilantro, jalapeno pepper, garlic, ginger, cumin, salt and pepper, egg or flaxseed as a binder, and flour. This combination makes a really nice flavored burger, and the mixture holds together well as a patty… but the interior texture of these burgers is soft. So I’ve been using this recipe as a starting point and experimenting with additional ingredients and different techniques. 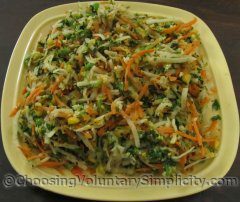 I have squeezed the shredded or grated vegetables and drained them in a colander (the amount of liquid from this is amazing) and even patted the drained vegetables dry. 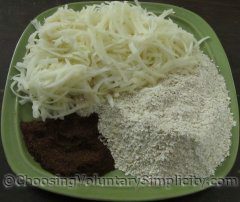 I have substituted other “texture ingredients”… finely ground oats, bread crumbs, ground nuts, and even barley and rice. I have made burgers with a variety of other vegetables, including sweet potatoes and broccoli. I have chilled the burger mixture for at least an hour, which is supposed to firm everything up. The burgers taste delicious, and the various ingredients give an interesting texture… but the interior of the burgers is always softer than I would like. The goal of all the burger recipes I have tried… and the goal of all the burger recipes I have studied and not tried… seems to be to create a mixture that will hold together as a patty. Without exception, all of the recipes I have tried easily achieve that goal. Perhaps the commercial burgers were dehydrated…? I’m beginning to wonder if the drier texture I remember from the commercial burgers is even possible in a homemade vegetable burger. I hope you’re able to work this out because the softness of homemade vegie burgers bugs me too. I have tried most of the things you mentioned and you’re right – the insides are still soft. The other nonmeat burgers I make are also soft. They all taste good though. I had never really thought about this until I read this post but I have always thought that the burgers were too soft. My guess is that the commercial ones are dehydrated or something first. I too hope you figure this out. I’m vegan, so veggie burgers are high on my list. 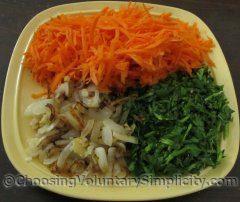 I’m wondering if you could try salting the veggies to extract more water. Another thought just occurred to me: add corn starch?